My entry, "Sisters of Steam" is up on the Submissions page. If, in the next few days before the deadline, you get the urge to do a few revisions, feel free to upload a new version (just put a 2 at the end of the filename, and I'll make sure to judge that version). I won't be reading submissions until the deadline hits. It will take me a little time after that to actually go over them all, so I encourage everyone to read each others' entries and give some feedback of your own. I will add that, though I won't be reading the submissions until deadline, I will open the file once to make sure I can read it. Lachlan99, your file opens fine. About the artwork. I did say that the submission must be entirely the creation of the entrant(s) and that it must be created entirely in the time of the contest. Would you be able to submit a version without the antique art? I'll try to find a way that people can post a prettied-up, cleaned-up version of their games. I'm not quite done yet, but I did want to post my cover, because I think it's pretty. It's now less than 24 hours until the deadline, which will be midnight, Sunday, December 7 as of this clock. I hope you've all had fun with the challenge. As a reminder, only artwork (indeed, any work) created by you in the last 10 days may be included in the submission. I'll make a page for everyone to post an extra-pretty versions, including versions that may get revised once you've had the pressure of the contest lifted (and maybe a little feedback, too). If you don't want your game to stay up, then let me know and I'll remove the file once I've downloaded it. It will take me some time go through the submissions, depending on how many submissions there end up being. In the meantime, feel free to read a few yourself and give your own feedback. All done! Forbidden City is up. The four bowls of dice are wonderfully evocative, and got me thinking about other randomizers-in-containers. I like games with a tactile element (props, counters, and so on), and this one reinforces the mood, too. I have some beautiful dice, which I bought to play last Wednesday. Have you tried finding yellow dice? It's bloody impossible! Well, I finished my game, Unity and I've uploaded it. I tried to take the things you'd expect in a zombie game and totally reverse them, while still keeping a similar theme of having to stick together against something that wants you to become one of the masses. 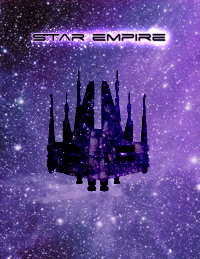 Also, I really like the cover for Star Empires. Very nicely done. An unvarnished copy of Rivers and Lakes has been posted and uploaded. It's an attempt to be a story-based approach to wuxia instead of combat-art-based approaches like I've seen in the past. Excellent! I'm going to read it now. The no-graphics version of Star Empire and its character sheet have been uploaded. At first I thought you'd accidentally used 'zork' and 'myst' for skill names…then I realized it was quite deliberate. CLEVER fellow. I like this game so much I think I'd like to produce it for Indie sale when this contest is done. Not sure what needs to be done in conjunction with this creative content license—just removing it from the site after the contest? 61 pages?????? Woman, when do you *sleep*? c_c I type fast? Actually very little this week.